Widespread discussion of increasing the minimum wage has recently sparked action. In 2013, laws to raise the minimum wage were approved in five states, the District of Columbia, SeaTac (an airport zone) in Washington, and Montgomery and Prince George’s counties in Maryland. To date in 2014, Connecticut and Delaware approved laws to raise the state minimum wage and over 30 states are considering minimum wage hikes. While policymakers continue to debate the merits of increasing the federal minimum wage, it is important to understand the labor market implications of such a policy. Unfortunately, these very effects are controversial. To what extent will a rise in the minimum wage hurt overall hiring and employment? Would any effects be concentrated on low-skill workers and sectors? The variety amongst state minimum wages provides a natural experiment from which to learn. Nineteen states enforced minimum wages above the federal minimum of $7.25 per hour and thirty-one had minimum wages equal to $7.25 in 2013. This paper uses recent data to analyze the impact of raising the minimum wage on employment among the 50 states. 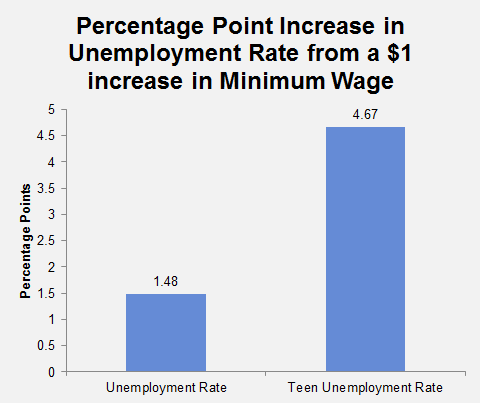 As shown in the following charts, the analysis finds that in 2013, a $1 increase in the minimum wage was associated with a 1.48 percentage point increase in the unemployment rate, a 0.18 percentage point decrease in the net job growth rate, a 4.67 percentage point increase in the teenage unemployment rate, and a 4.01 percentage point decrease in the teenage net job growth rate. Consequently, high state minimum wages increased unemployment by 747,700 workers and reduced job growth by 83,300 jobs. Minimum wage advocates often point to the state of Washington, which has the highest minimum wage in the country, as well as strong job growth. Washington provides evidence to minimum wage advocates that raising the minimum wage does not result in layoffs or reduced hiring. However, this simplistic approach to evaluating the labor market implications of the minimum wage has two main problems. First, Washington is only one observation among several states that also have minimum wages above $7.25 per hour. An effective analysis must take all states into account. Second, the approach ignores factors that could affect the labor market characteristics of a state and the state’s decision to raise its minimum wage. In particular, the high net job growth in states like Washington could in part be causing lawmakers to raise their minimum wages because they can afford to do so. How do states compare? Bureau of Labor Statistics (BLS) data reveal that during 2013, states with minimum wages above $7.25 per hour averaged higher unemployment rates and lower net job growth rates than states with minimum wages at $7.25 per hour. Table 1 indicates that labor markets in states with high minimum wages did not perform as well as those in states with low minimum wages. In particular, the mean annual average unemployment rate in 2013 in states with minimum wages above $7.25 per hour was 7.4 percent, 1.0 percentage point above the 6.4 percent mean annual average among states with the federal minimum wage. In addition, the mean annual average net job growth rate in states with high minimum wages was also slightly lower in 2013. Even though this evidence indicates that the minimum wage negatively affects job markets, the differences between states with minimum wages above $7.25 per hour and those with minimum wages equal to $7.25 per hour were fairly small in 2013. However, since very few people actually earn the minimum wage, evaluating its effect on total employment levels is bound to generally yield small numbers. A better way to capture the minimum wage’s impact on jobs is to examine the low-skilled populations that minimum wage hikes actually affect. This generally includes teenagers ages 16 to 19, who are inherently low skilled workers. In 2013, teenagers made up 24.2 percent of all workers earning the federal minimum wage. Table 2 zeroes in on this population. The figures in Table 2 suggest that states with high minimum wages in 2013 averaged poorer labor market outcomes for 16 to 19 year olds than states with low minimum wages. As expected, the negative effect on employment was much larger among teenagers than it was for the total population. The mean annual average teenage unemployment rate in states with minimum wages above $7.25 per hour in 2013 was 22.5 percent, which was 2.0 percentage points above the 20.5 percent mean annual average unemployment rate in states with minimum wages at $7.25 per hour. Even more pronounced was the difference in net job growth rates among teenagers. In high minimum wage states, the net job growth rate for teenagers was actually negative in 2013, with a mean annual average rate of -0.5 percent. This was 2.3 percentage points lower than the mean annual average net job growth rate among states with the federal minimum wage. In those states teenage employment levels increased 1.8 percent from 2012 to 2013. The above statistics demonstrate that in 2013, states with minimum wages above federal levels tended to have more poorly performing labor markets. However, the figures in Tables 1 and 2 do not provide precise estimates for how increasing the minimum wage impacts the labor market as other factors such as workforce skills likely affected the unemployment and net job growth rates in each state. This paper addresses these issues by running the following regression analyses. Yi represents one of the four dependent variables (unemployment rate, net job growth rate, teenage unemployment rate, teenage net job growth rate), MinWage represents state minimum wage level, Education is a measure of state educational levels, and (MinWage*Education) is the interaction term for minimum wage and education. The following sections describe each variable in detail. This analysis uses 2013 minimum wage levels, which correspond with the annual average employment data provided by the BLS. While in the previous section the analysis essentially treated the minimum wage as a binary variable by comparing states with minimum wages above $7.25 per hour to those with minimum wages at $7.25 per hour, the minimum wage variable in Equation 1 is continuous and accounts for the minimum wage in each state. Consequently, the regression analyses will measure how changes in the state minimum wage impact the labor market. As previously mentioned, other factors besides the minimum wage could affect the labor market in a state. One important factor that contributes to state labor market performance is education. A state with a highly educated population likely has a very skilled workforce and faster growing industries, which result in low unemployment and an abundance of job creation. Likewise, a state with an uneducated population likely has a low skilled workforce, resulting in limited innovation, stagnant industries, and little job creation. Thus, it is important to hold workforce skill levels constant when measuring the impact of an increase in the minimum wage. The variable used to control for education levels is the 2008 to 2012 average percent of those 25 years or older with a high school diploma, provided by the Census Bureau. The model also controls for the possibility that the relationship between minimum wage and labor market performance depends on the education level of a population. For instance, the impact of increasing the minimum wage on employment could be smaller when a large portion of the population finished high school. As a result, states like Washington – where 90 percent of its 25 years and older population finished high school – are more likely to be able to afford an increase in the minimum wage. To address this issue, the regression model introduces the interaction term, which is the product of the minimum wage and education variables. In each regression the coefficient on the minimum wage variable and the interaction term were jointly statistically significant, suggesting that high minimum wages negatively impacted labor markets in 2013. Moreover, the results reveal that increasing the minimum wage has larger negative effects on labor markets than Tables 1 and 2 suggest. Table 3 reveals that in 2013, assuming average education levels, a one-dollar increase in the minimum wage was associated with a 1.48 percentage point increase in the overall unemployment rate. This relationship is statistically significant at the one percent level. In addition, a one-dollar increase in the minimum wage was associated with a 0.18 percentage point decrease in the net job growth rate (significant at the 5 percent level). As expected, the negative impacts of increasing the minimum wage were far more pronounced when specifically evaluating teenagers (ages 16 to 19). The results suggest that when assuming average education level, in 2013, a one-dollar increase in the minimum wage was associated with a 4.67 percentage point increase in the teenage unemployment rate and a 4.01 percentage point decrease in the teenage net job growth rate (both significant at the 1 percent level). These results are consistent with substantial academic research, which consistently find that raising the minimum wage reduces teenage employment levels. These findings suggest that in 2013, state minimum wage laws were detrimental to labor markets. Table 4 illustrates how having a minimum wage above $7.25 per hour raised unemployment rates and the number of unemployed persons. The results imply that in 2013, the higher the minimum wage, the more substantial the increase in the unemployment rate. For instance, high minimum wages raised Oregon’s and Washington’s unemployment rates by 2.52 percentage points and 2.87 percentage points respectively. In total, 747,700 people were unemployed in 2013 because of high state minimum wages. The rise in unemployment ranges from 2,600 in Maine to 206,700 in California. Teenage unemployment rates had a similar trend. Oregon’s minimum wage raised the teen unemployment rate by 7.94 percentage points and Washington’s elevated minimum wage raised it by 9.06 percentage points. Between all the states in Table 4, minimum wages above the federal level increased teenage unemployment by 84,800. Table 5 shows how raising the minimum wage affected job creation in 2013. The total net job growth rates were greatly hindered in states with minimum wages above $7.25 per hour. The reduction in net job growth rates associated with high minimum wages ranged from 0.02 percentage points in Missouri to 0.35 percentage points in Washington. While the percentage point reductions seem small, the losses in new jobs were substantial. The decrease in net job growth due to the minimum wage ranged from 300 jobs in Maine and New Mexico to 27,400 in California. The minimum wages in all the states in Table 5 reduced total employment growth by 88,300 jobs. 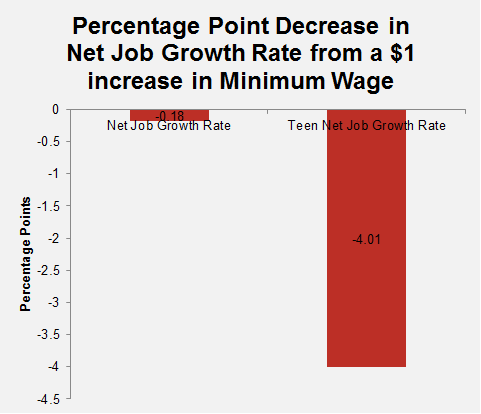 In 2013, high minimum wages reduced net job growth rates far more substantially among teenagers. The high minimum wages in Oregon and Washington decreased the state net job growth rates by 6.82 percentage points and 7.78 percentage points respectively. Together all of the state minimum wages above $7.25 per hour cost teenagers 53,800 jobs. Considering that the high minimum wage states reduced total net job growth by 88,300, this reveals that the majority of the loss in hiring was borne by teenagers. The results indicate that when holding education constant and taking into account all 50 states, increasing the minimum wage actually has a devastating impact on job markets in the United States. Not only is there evidence that total unemployment rates increase and job creation decreases, but there is also substantial evidence that teenagers suffer the most. With the national teenage unemployment rate persistently above 20 percent, increasing the minimum wage is the last thing the future of this country needs. It should be noted that in 2013 a number of states required minimum wages below $7.25 per hour. Four states had laws mandating minimum wages below $7.25 per hour and five had no minimum wage law at all. However, federal minimum wage law made those state minimum wage laws (or lack of laws) irrelevant. In practice, employers in those states are still required to pay the federal minimum wage of $7.25 per hour. As a result, to fairly measure the impact of increasing the minimum wage, this paper assumes that in 2013 the minimum wage most employees in those states could earn was $7.25 per hour. All data come from the Bureau of Labor Statistics Annual Average tables. Mean annual unemployment rates are derived from the Preliminary 2013 Data on Employment Status by State and Demographic Group available at http://bls.gov/lau/ptable14full2013.pdf. Mean net job growth rates are yielded by calculating the percentage change in employment levels from the 2012 Annual Averages tables to the 2013 Preliminary Annual Averages. The 2012 tables are available at http://bls.gov/lau/table14full12.pdf. Census Bureau, State & County QuickFacts, available at http://quickfacts.census.gov/qfd/index.html.